Indianapolis Colts’ Pro Bowl punter Pat McAfee walks away from his NFL career to pursue comedy! It’s not often that someone who’s on top of their craft walks away in their prime, but that is exactly what Indianapolis Colts’ punter Pat McAfee did this week. 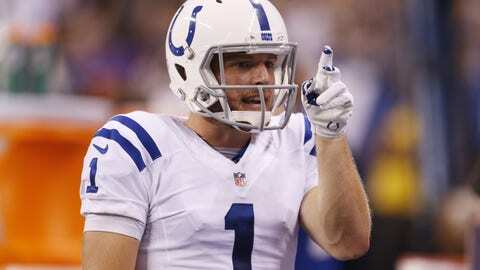 In an interview with the Indianapolis Star, McAfee explained why he is leaving football for, wait for it, comedy! Yes, McAfee, who has dabbled in comedy before, is leaving his multimillion dollar job for a yet to be determined gig at Barstool Sports. It was a hard decision, very, very hard because I absolutely love the Colts. I love [Colts’ owner Jim] Irsay and I love my teammates and all the young guys we have, so it’s very difficult. But whenever you’re a creative person, whenever you can make somebody laugh, that’s real fulfillment. You’re making somebody’s day better and this is giving me that [opportunity]. McAfee continued talking about the decision, expressing his love for punting in the NFL and the focus that it took to be great enough at what he did to earn one of 32 jobs in the league. However, he said that this decision had a lot to do with being ready to focus on something else. McAfee, who signed a five-year, $14.5 million contract in the 2014 offseason, is walking away from nearly $6 million. He is coming off his second Pro Bowl season in which he led the NFL with a 49.3 yard average, and was named to the Associated Press All-Pro team in 2014. Widely regarded as on the best punters around, McAfee also made a name for himself with some big time hits on returners, including this one on Trindon Holiday. McAfee has written screenplays and poetry, and has also been a stand-up comic for several years. While his role at Barstool Sports is uncertain, one thing appears to be clear: McAfee will finally be happy in his line of work. While this news is shocking, you do have to respect a person for turning down millions of dollars to pursue a passion. Here’s hoping that McAfee has a successful second career!